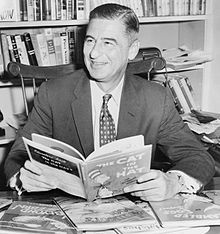 It is sometimes said that Theodor Seuss Geisel, better known as Dr. Seuss, purchased a large house overlooking the University of Virginia, so that he might look down on the university after several rejections of his application to attend. This appears to be based on the connection between the "Whos down in Whoville" and UVa's "Hoos". However, this is one of Charlottesville's urban myths..
↑ Theodor (Dr. Seuss) Geisel, Charlottesville VA & Horton Hears a Who!, Bill Lupfor, Visit Florida Attractions, March 14 2008, retrieved 19 Jul 2009. ↑ The Declaration, Sept. 16 1999. ↑ University of Virginia - The Inside Scoop, College Prowler, retrieved Jul 19 2009. ↑ University perpetuates tradition of popular myths, superstitions, Katie Pfleger, Cavalier Daily, August 26, 1995, retrieved Jul 19 2009. This page was last edited on 19 April 2012, at 11:58.